Try Samples of 3 Unique Emails with different Integrated Forms in Email in your inbox. Your message was sent successfully. Please check email for Integrated Forms Sample. Companies can collect data from customers either through a dedicated landing page, or by using integrated forms in the email body. 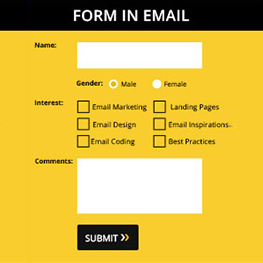 The advantage of integrated forms in email is that it increases the form filling efficiency by many times. Currently, Text box, Paragraph, Check Boxes and Radio Buttons are used. Fashion Retailers can use it to know what their customers like or what is currently in trend. Travel and hospitality services can display the tour options with their prospective clients or customers using emails, which change the landing page based on the selected answer. Restaurant owners can send Promotional emails to get subscribers fill the form once they have visited their restaurant. E-commerce websites can send Transactional Emails that ask for the product feedback along with the receipt of purchase. Educational Institutes can send a checklist of the important books to be purchased by their students. Email clients like Apple Mail, Gmail Desktop, Yahoo Desktop, AOL and Outlook on Mac will be having functional form. On the other hand, Lotus Notes, Outlook 2007, 2010, 2013, Outlook.com, Mobile third party applications like (Gmail app, Yahoo app) etc. will have proper fallback support - thereby helping you to get user details as desired. Thunder Bird will display the form but the form will not work. Apple has limited support for text area, so Apple users might not be able to fill the text box. The users might not able to input ‘space’ between words. The troubleshooting option is to press “alt+space” to input a space. If you wish Monks to build your Email Template containing Integrated Forms.